For the past month I have been debating a pair of OTK boots. They look so fabulous on a lot of bloggers I follow, but if I am going to make a purchase, I want to know it will work for my life and get enough use. So prior to deciding, I put together a few holiday looks on how I could wear OTK boots for the holidays. The boots I chose are from Choies and just $54! At this point I think could fit into my budget and get quite a bit of use, especially for those holiday get togethers! Check out the three holiday looks I made with OTK boots! I just got a pair of leather pants I am in love with and eager to wear. What a better way than with a festive red top, fur vest, and plaid bag? It's always hard to get dressed up in the Midwest during winter. Opting for a sweater dress and OTK boots with tights help keep me warm! Love the plum color of this one! I am falling for this faux leather burgundy skirt! Paired with OTK boots, it's just right for a holiday party! 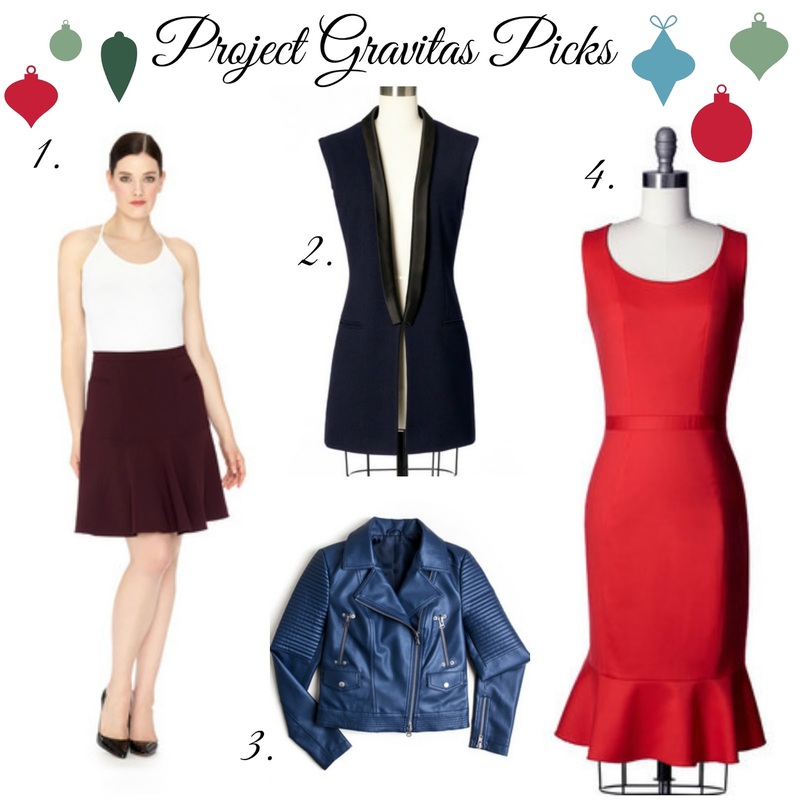 Today Project Gravitas is giving away five $50 gift cards to their store! Project Gravitas is all about inspiring women to find their gravitas with luxury fabrics and products that are made in America. Enter to win below and Good luck! 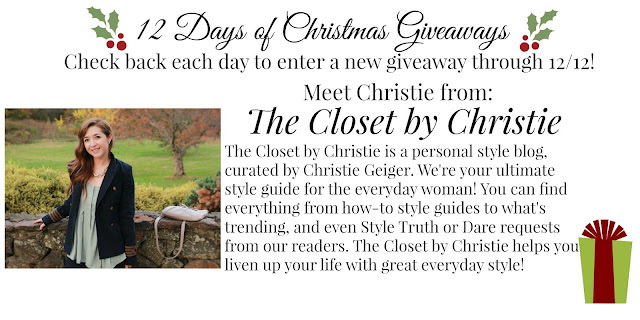 Today's featured blogger is Christie from The Closet by Christie. She's adorable and has a feminine classic style I love. Go check her out! If you haven't already, make sure you enter Day 1 and Day 2, Day 3, Day 4, Day 5, Day 6, Day 7, Day 8, and Day 9 Giveaways! Those OTK boots are amazing! Love all three of the looks you put together. My favorite is the first one! you really showed the versatility of them! and such a steal at $54!! SO many great picks here. That burgundy dress would be a must for me. I really love those boots, too and the fur vest. I love my OTK boots! I have been so surprised at just how much they go with. I was gifted that pair, and I liked them they were just too short on me (at the knee vs over). I bet you'll love them! I bought my OTK boots this year - and I love them. Also, I got the Ivanka Trump ones, and they can be worn slouchy below the knee, too, which is perfect for work. I don't know if I'll try the otk boots or not, I'm not sure it's me. Love today's giveaway-- great company and awesome items! And I am in LOVE with that lace sweater dress-- gorgeous! Do you think the sweater stops pretty high where the lace starts? Just wondering how "short" it is AKA if it's appropriate for church, etc. Didn't you partner with Choies? How is their sizing? Just adorbs! Too many cute pieces! I love that red dress and all of the leather. I have a serious love for leather/pleather stuff haha. Especially jackets! Thanks for linking up to Top of the World Style. If I wear boots over 40 you can do. You are in your 30s! There is no fun to cold knees when the temperatures drop. Get a pair asap! I love all the pretty looks you've put together. Thank you for being a part of TBT Fashion link up and hope to see you soon! I need some nice black OTK Boots too and I would also love a pair in taupe or light gray. I have some taupe ones but they have seen better days. You have created 3 great looks with them. I would wear the first one in an outfit. It is so me. I love red especially in a red blouse and also the leather skinny pants and fur vest are things I love and wear myself quite a bit.